On June 8, one of America’s most hateful group, Anti-Defamation League, submitted a series of proposals to House Foreign Affairs Committee, designed to limit the influence and military capability of Hizbullah, the Lebanon-based Islamic Resistance group which is not only a charitable organization but also leads the opposition groups in country’s 124-member parliament. Lebanon’s Christian president Michel Naim Aoun is an ally of Hizbullah. During he visit to Saudi Arabia, Gen. Aoun told the Saudi ‘royals’ that Hizbullah is the real defender of Lebanon. Apply secondary sanctions to financial entities connected to Hizbullah and/or its associates. Identify, designate and sanction more individuals belonging to the organization’s leadership cadre. Highlight Iran’s role in financing Hizbullah and assessing ways to stem the cash and arms flow from Tehran. Investigate and expose intelligence and logistical support networks in the Latin American region. Considering the Israeli terrorism in past, it would be appropriate to substitute Israel to Hizbullah. After all, it’s Israel which had received US$3 trillion aid during 1980-2004, and not Hizbullah. ADL proposals were in the aftermath the arrest of two US citizen allegedly linked to Hizbullah. Hizbullah is classified as a terrorist organization in Israel, the US, Canada, UK, Saudi Arabia, and UAE. Let’s believe for a change that the allegations against those two Americans can be proved in a court of law which one doubt very much considering what happened to Muslim inmates at guantanamo bay Auschwitz – how about those 80 Senators and 350 Congressmen who have ties with Israeli terrorism againgst United States. Ironically, last year, Israeli veteran columnist, and former member of Jewish terrorist group Irgun and Israeli Knesset, Uri Avnery claimed that Hizbullah is not a terrorist organization. Is Iran really arming Hizbullah? Well, if one has to believe Israeli propaganda lies – The Tower news site (January 11, 2016) claimed that Russia is providing Hizbullah with advanced weaponry, including long-range tactical missiles, laser guided rockets, and anti-tank weapons. Hizbullah is supported by Lebanese diaspora communities in Latin America. In February 2017, Trump administration put sanctions on Lebanese-born Venezuelan Vice-president Tareck El-Aissami, over his alleged links to Hizbullah. Washington put a freeze on El-Aissami’s assets, mostly in real-state, which would soon be opened for the families of 147 Israeli soldiers killed by Hizbullah fighters in 2006 war to dip-in. 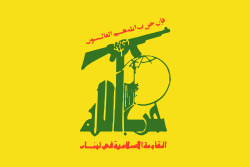 Hizbullah is the only Arab militia which defeated Jewish army in 2000 and 2006. Now, Netanyahu and the Jewish lobbying groups in the West are drums-beating for a new war with Hizbullah to settle the old scores at the risk of annihilation of half of Jewish population without destroying Hizbullah.